Andy Sherry started Karate in 1959 and received his Shodan in 1966 from Sensei Enoeda. 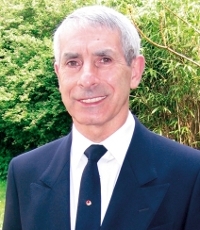 In 1966 he helped form the Karate Union of Great Britain and in 1973 was elected Chairman, a position that he has been continuously elected to until this present day. He is also the KUGB Chief Instructor and Chairman of the Technical Committee. He had a highly distinguished competition career and in 1967 he became the first British All-style Kumite Champion at the Empire Pool, Wembley. He won the EAKF European Kumite title in 1968 and then went on to win many otherÂ British and European individual and team titles in both Kata and Kumite until his retirement from competition in 1977. He was elected as KUGB Chief Instructor and Team Coach when Sensei Enoeda passed away in 2003 and under his guidance, the KUGB have continued to achieve great international success. In 2007, the England Squad took the European and World Team titles. The KUGB is Britainâ€™s largest single-style Karate Association and its development and technical achievements have been driven by Andy Sherryâ€™s passion for the art. He has been one of the main driving forces for the growth and development of Karate in this country and is well known and respected across all styles. He continues to train daily and is constantly in demand as a teacher in this country and abroad. He was awarded the rank of 8th Dan by the KUGB in February 2004. He has attended, in the capacity of competitor or coach, every European Shotokan Championship under their various titles from the EAKF in 1968 through to the present day ESKA.